Created for the playful, unpredictable, independent woman who treats every day like an event and adventure. This is a woman who likes to make her own magic, this sheer, flirty blend of water lily, lady apple, mandarin meringue, and golden apricot skin are melded with sheer floral notes, accented with dark chocolate, and finished with a pink frosting accord, amber, warm woods, musk, and vanilla - a whimsical treat. Fragrance Notes:Water Lily, Lady Apple, Mandarin Meringue, Golden Apricot Skin, Ripe Pink Guava, Tahitian Flower, Wild Tuberose, Dark Chocolate, Pink Frosting Accord, Precious Amber, Forbidden Woods, Royal Musk Captive. Product is so fresh and clean. This item was bought for our granddaughter, she absolutely loves it. While the smell is great... disappointed the scent is gone in a couple of hours after applying it on! I adore this perfume and whenever i wear it i always gets tons of compliments. 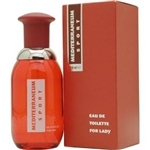 it smells really good, its not overpowering and it could be use anytime but best at a romantic rendez-vous!